RETRO KIMMER'S BLOG: LEVON HELM MEMORIAL BOULEVARD! WEST HURLEY, N.Y. — State Route 375 was dedicated as Levon Helm Memorial Boulevard on Friday by admirers who said the singer and drummer always would stick by his friends and work to help underdogs beat the odds. An afternoon ceremony near the intersection of Routes 375 and 28 drew about 125 people, including state Assemblyman Kevin Cahill, who sponsored the legislation allowing the road designation. 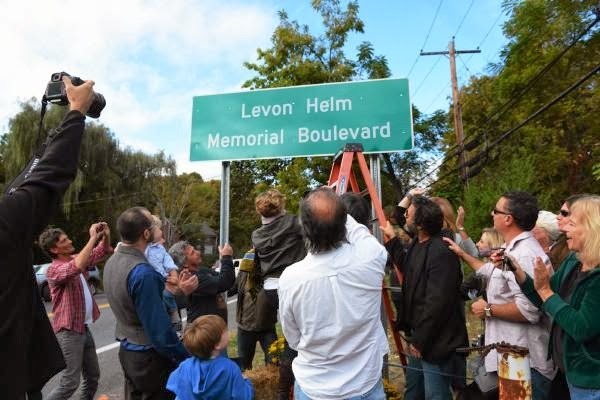 A sign bearing the words “Levon Helm Memorial Boulevard” was unveiled during the event. The road renaming applies to the entire 3-mile length of Route 375, which runs from Route 28 in West Hurley to Route 212 in Woodstock and passes near the home where Helm lived on Plochmann Lane in Woodstock. He lived there until his death at age 71 in April 2012 after a battle with throat cancer.